A 100% toxin free bubbling wash with natural ingredients for your little one! 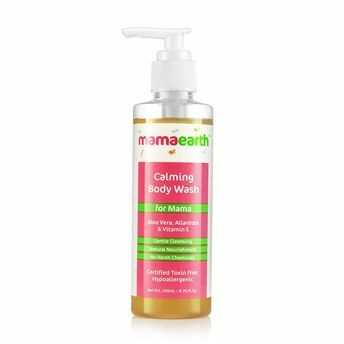 Mamaearth Calming Body Wash is here for you, a completely harmless, chemical-free wash to clean your body as well as that beautiful baby tummy. Be rest assured, it is gentle on your skin, is an amazing cleanser and it also nourishes your body with natural goodness of some unique and constructive ingredients. Go ahead and take that long shower. Body Wash with Natural Cleansers - Enriched with the goodness of Coconut based cleansers and Jojoba Oil to nourish your skin. Natural Nourishment- Allantoin helps skin to lock in moisture and promote healthy cell development thus preventing dull and sallow skin. Uplifts & Rejuvenates Mood- Geranium helps replenish and rejuvenate the skin. No parabens, sulfates, mineral oil, synthetic fragrances, etc. Explore the entire range of Shower Gels & Body Wash available on Nykaa. Shop more Mamaearth products here.You can browse through the complete world of Mamaearth Shower Gels & Body Wash .